It’s been a year that NYX moved to India and the love for this brand knows no bound for makeup lovers, including me of course!This post is all about 3 soft matte creams of different colour family for different occasion and how well it works! Neither lipstick nor lip gloss, NYX soft matte lip cream is a new kind of lip colour that goes on silky smooth and sets to a matte finish. Velvety smooth Soft Matte finish. Sweetly scented and delightfully creamy. Nyx soft creams are LOVE right from their pricing,packaging,pigmentation, to the shades (11 stunning shades to choose from ).It has a buttery creamy texture with a sweet scent when applied takes 30 to 40 seconds to completely matte down. It sits extremely comfortable on the lips for 3-4 hours easily.The formulation is worth mentioning not too drying but you have to apply it twice ( horizontally and vertically) to make it opaque.It’s always a good idea to moisturise your lips well prior application. 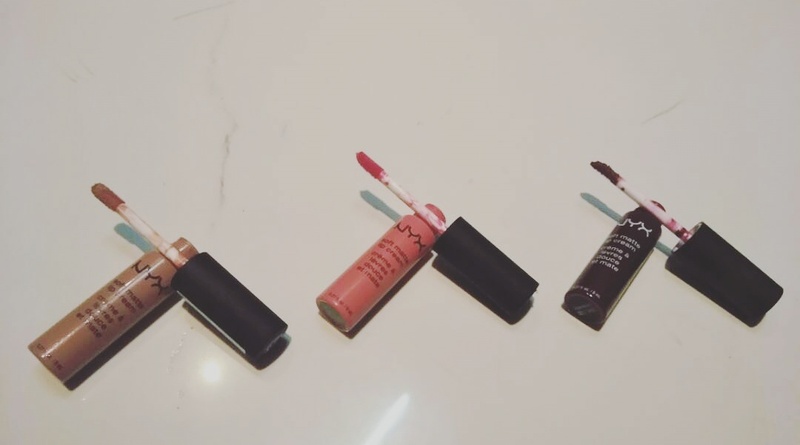 A liquid matte lipstick with all of the above is all a lipstick lover can ask for ! A bright neon pink to brighten up your day, compliments medium to fair complexion.A perfect pop of colour to cheer you up making you forget all the blues. So go ahead and experiment with different colours.! Thank you beautiful for dropping by !